A recent article by Michael Krutzen et al. documents the first case of tool use by wild bottlenose dolphins in Shark Bay, western Australia (http://www.pnas.org/cgi/reprint/102/25/8939). This finding adds more debate to the questions of human evolution and our separation from the animal kingdom, as the discovery and definition of tool use has surfaced from studies of primates, marine mammals, and birds has done before it. Therefore, it stands to question: What makes us special when it comes to tools, and why is this such a big deal? For many years it was thought that the development of our frontal lobe gave us special capabilities in problem solving and motor function, among others, which allowed us to manufacture and use tools; a trait, which until recently, was believe to be strictly human. With relatively undisputable evidence to the contrary, as advanced primates, we have decided to evolve ourselves to an even higher level, and alter our definition of “tool use” to ensure our separation from the “others”. Thus, what makes us special is that we are the only animal which can classify everything else, and defend the definition of ourselves. Our use of tools is different and more important because we can say so. But is this not a little shortsighted? 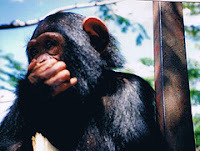 Is a chimpanzee’s stick any different than our fishing rod and net? (http://www.journals.uchicago.edu/AN/journal/issues/v164n5/40471/video2.mov). Is a Sea Otter not using a primitive hammer to crack open shells? And now there is evidence of Dolphins using sea sponges to protect their snouts while digging for food. And birds using sticks like the chimpanzees (http://ca.youtube.com/watch?v=xwVhrrDvwPM). How are these tools different from ancient humans? Well, if we use BB Beck’s definition of a tool as a template, it becomes evident that it is not what the tool is, but how it works. Beck includes a specific definition of six different types of tools: object thrown at predators, objects used to hit predators, hunting weapons, objects for social displays, objects to clean body parts, and objects made and used to acquire food (from Animal Tool Behavior, Garland Press, 1980). Therefore, what has been evidenced as tool use by dolphins and birds, only falls into a single category. Primates other than humans can get away with two: the great apes has been observed using modified implements to acquire food, and for hunting prey and attacking each other. Of course, the perfect definition of tool use includes all things that humans do with tools. All six types of tools are easily within the human toolbox, and if we re-examine the Wikipedia definition, we are the only animal which has been observed using tools to make tools: using an object to more easily create another object to complete a task. We make tools to separate us from the rest of the animals, we make better definitions to separate us from the primates, and we believe these definitions in order to reassure ourselves that we’re doing something right.